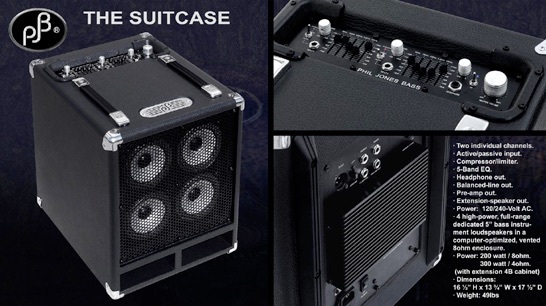 The Suitcase has the same transparent sound as the Briefcase but it packs more of a punch so you can now use it at any kind of situation including keeping up with a busy drummer. It’s small, lightweight, so it’s easy to get in and out of the gig and it’s easy to get a great sound with just about any bass. It even has two channels so you can play acoustic or electric (or whatever combination suits your needs) and set each channel for your ideal tone. Not only that, you can actually play two instruments through this amp at the same time thanks to its huge internal power supply and solid state output section. How many other amps can support that claim? Its versatile tonal range allows this amp to work with just about any instrument that requires an amplifier. Keyboards, guitar, drum machine, you name it; they will all sound good thanks to the four PJB proprietary speakers. At 5 inches they may seem tiny, but they pack a punch across the whole audio spectrum. Good bass, transparent, natural mids and highs. “What if I need more power?” you may ask. 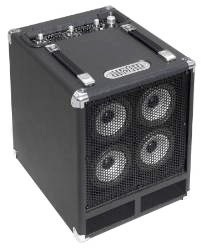 Just add the compact PJB extension 4B cabinet and you will have all the bass and volume you ever need on a stage. The suitcase has power to spare and you will wonder just how it keeps on giving out all that power with absolute fidelity. The Suitcase has been through a survival course; it has been dropped, shaken, overloaded, over heated and yes, played through and after all of this, the Suitcase still works. We build it to be not just a great amplifier but a tool that the hard working musicians in our fraternity can truly depend upon.